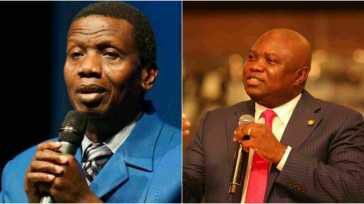 The General Overseer of the Redeemed Christian Church of God, RCCG, Pastor E.A Adeboye has denied report published by one of the national dailies NOT VANGUARD, that he spoke with the leader of All Progressives Congress, APC, Bola Ahmed Tinubu on Akinwumi Ambode’s second term bid. Disclosing this through his tweeter handle, Adeboye averred that he has never been involved in any intra or inter party politics in Nigeria and would likely never be in future. In the purported report, the paper said that a source close to Tinubu, who chose to be anonymous because he was not authorized to speak on the matter, confirmed that there was a conversation between the APC leader and Pastor Adeboye on Ambode’s second term. The paper said, “We authoritatively gathered that Pastor Adeboye’s intervention is one of the latest moves by Ambode to persuade Tinubu to support his second term bid just like he did in 2015.“It was learnt that the revered Christian leader had inquired through telephone conversation with Tinubu to know how the issue of the APC primary could be resolved.“But the former governor insisted on direct primaries in the interest of fairness and justice for those who had obtained the APC forms for governorship primary in the party. “Although the telephone conversation, which had been converted into a text was silent on what Pastor Adeboye said, Tinubu was quoted to have maintained his posture that all contenders should go to the field and test their popularity before the people they want to govern.“The APC leader said he had been accused of imposition in the past and would not want tobe seen as imposing any aspirant on the people in line with what democracy entails. Tinubu in the text message which was going viral on twitter told Pastor Adeboye that: “Sir, people have been accusing me of imposition.“They say I imposed candidates at will. Reacting on the above statement Adeboye opined, “Our attention has been drawn to news making the rounds from dailies especially the New Telegraph Pastor E.A Adeboye, the General Overseer of the RCCG had a recent phone conversation with the Leader of the All Progressive Congress(APC). “We would like to inform the general public that this is false and Pastor E.A Adeboye has not and would not be involved in inter /intra party politics in Nigeria and anywhere RCCG is present across the world. Pastor E.A Adeboye advices all well meaning Nigerians just like him to get their PVC’s and exercise their civic duty. God bless the Federal Republic of Nigeria”.